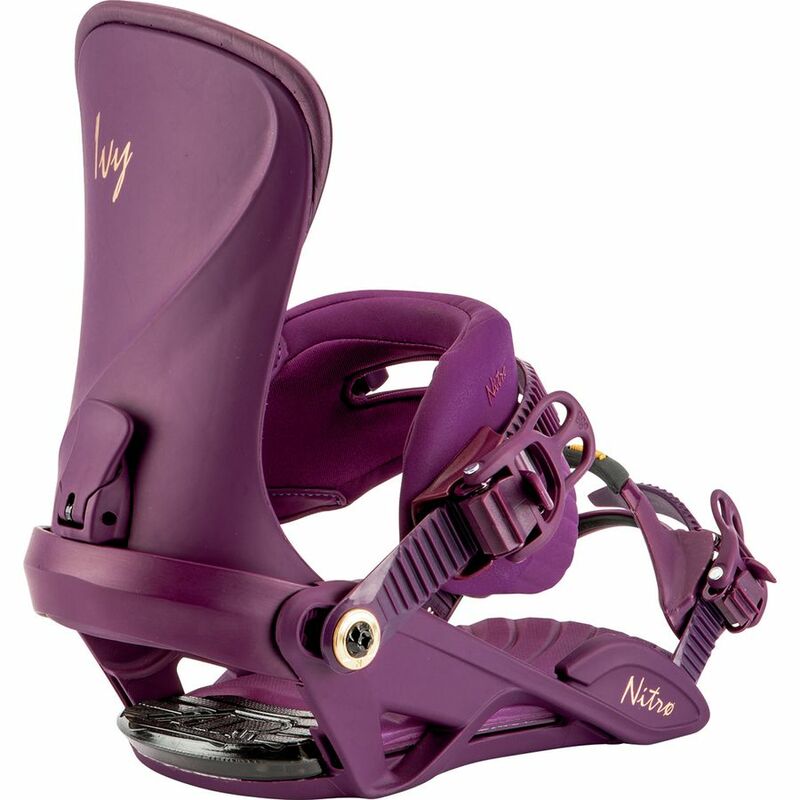 The Nitro Ivy Women’s Bindings are great for those semi-freestyle riders who also want to cruise around the mountain. They are a medium aggressive binding that offers a lot of dampening and tweakability but still give you enough support for more aggressive turning. 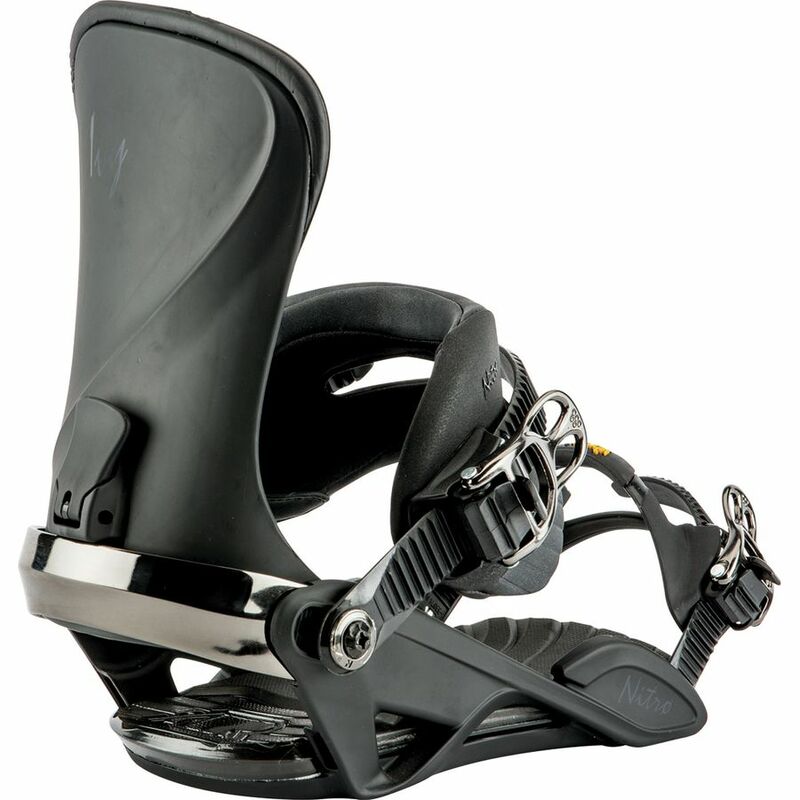 They would also be good beginner bindings because of the comfortable and forgiving ride that they offer. Highback Flex: Medium flex on the highback allowing for side to side movements but still gives you plenty of support. Boot Adjustability: Easily adjustable for toe and ankle straps, also has the highback rotation option as well as forward lean. Stance Width Adjustability: Nitro has a specific stance adjuster that locks in your angles so when you adjust your stance width you don’t have to worry about messing up the angles, it is helpful if you like to switch up your stance sometimes. Comfort: I found the Ivy bindings to be very comfortable, especially the ankle and toe strap, there is no pinching or squishing of the boot, the toe strap stays firmly in place without having to crank it all the way down, and the ankle strap is nice and soft but gives you support as well as tweakablitity with the “window” in the middle of the strap to allow for more flex. There’s also ample cush in the footbed and under the heel of the boot. The footbed is also canted so your foot sits in a more natural position in the binding. Boot Support: I found the Ivy bindings to give more of a freestyle type support to your boot. They aren’t very stiff if you like the aggressive binding feel, they are a little more on the playful side but give a medium amount of support. Turn Initiation: Turning was comfortable and fun, again I found the Ivy bindings to have more of a medium response and feel, so more freestyle and a little all mountain. Buttering: Easy and comfortable to tweak and butter around in these bindings. The medium stiff highback offers room for side to side movement, and the flexible ankle strap lets you tweak whichever direction you want. Ratchet System: The rachets worked smooth and easy. They didn’t get catchy when trying to take them off quickly and were comfortable against the boot. 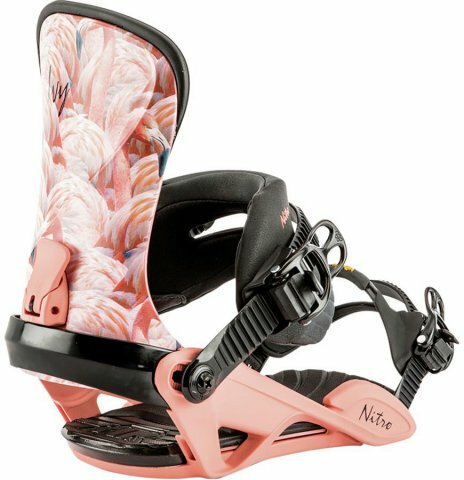 Shock Absorption: I found all the Nitro bindings I tried to have great shock absorption. The footbed is very damp and you also have Nitro’s “air dampening” in the heel for hard landings to help prevent heel bruise. Overall: I found the Ivy bindings to be a great all mountain freestyle ride. They are flexible enough to play around but still give you a little support for the more dynamic turning if you want. They are really comfortable and damp and offer that medium support for the freestyle riders who like to take top to bottom laps as well. If you are looking for a more aggressive binding from Nitro I’d go for their Poison bindings. We try to get as many images of the Nitro Ivy, but forgive us if they're not all there.